Israel is no friend of Africa. 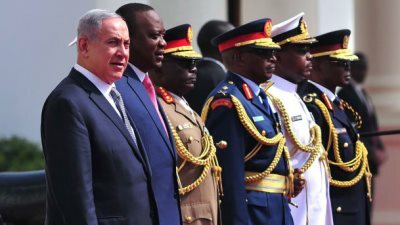 AFRICANGLOBE – A report says Israeli commandos are training local forces in more than a dozen African nations where Israeli arms exporters are already accused of being complicit in war crimes. Israel’s Channel 13 on Sunday showed footage of Israeli officers coaching Tanzanian troopers in hand-to-hand krav maga, hostage operations and urban combat, saying there is dramatic rise in Tel Aviv’s military activitites in Africa. Prime Minister Benjamin Netanyahu has made inroads into Africa a key part of his agenda, becoming the first Israeli leader to visit the continent in 50 years in 2016. “I’ve been in Africa four times in the last two years, that’s gotta tell you something,” Netanyahu said in a speech at an event in February. Over the past two years, he has traveled to several African states in a bid to convince them to stop voting against the Israeli regime at the United Nations. Israel is also said to be seeking to take advantage of insurgency and Takfiri militancy gripping parts of Africa to sell advanced military equipment to conflict-ridden states in the continent. Tel Aviv’s policy to spice up ties with Africa, the report said, also features combined efforts by Israeli foreign ministry, military, Mossad spy agency and the regime’s so-called security agency, Shin Bet. The report named Ethiopia, Rwanda, Kenya, Tanzania, Malawi , Zambia, South Africa, Angola, Nigeria, Cameroon, Togo, Ivory Coast and Ghana as among the African countries that Israel was seeking to stake out a niche. Israel’s military cooperation with the African states possibly emanated from the fact that many of those nations take part in peacekeeping missions on the border between the occupied territories, Syria and Lebanon, it said. It would be advantageous to Israel if these forces were led by Israeli-trained soldiers, said the report. An Israeli delegation has reportedly been traveling to countries in Africa and “carefully” weighing requests for further military collaboration. The delegation is taking into account how likely Israeli military expertise could be used in committing mass atrocities in the continent, the report said. Israeli media reported in November that Tel Aviv was actively working to establish diplomatic ties with Sudan, as part of wider efforts to upgrade relations with central African countries. The Israeli TV channel also reported that Israel’s ministry of military affairs recently summoned retired Maj. Gen. Israel Ziv for a hearing after the US accused him of selling $150 million in weapons to both sides of the civil war in South Sudan. Last year, the US Treasury Department placed sanctions on the Israeli businessman for his role in the civil war in South Sudan.